Yesterday, students, staff, invited guests and the public gathered together to discuss, engage with and enjoy six temporary pavilions constructed by the fifty-strong cohort of Year 1 students, assembled for just 24 hours after months of planning and development. Each pavilion acted as a live piece of 1:1 research, in which students analysed innovative engineering and architectural design techniques to feedback into further iterative designs. The projects support the students’ growing understanding of the design process, exploring ideas of craft, pre-fabrication and interactivity. “I am delighted with this year’s pavilions. Students on this programme are not afraid to make decisions, be mischievous and work as a team to create thought-provoking structures and environments. They demonstrated the creativity, rigour and fearlessness required of future lead designers of the built environment. I also have gargantuan respect and thanks for their urban design tutors. 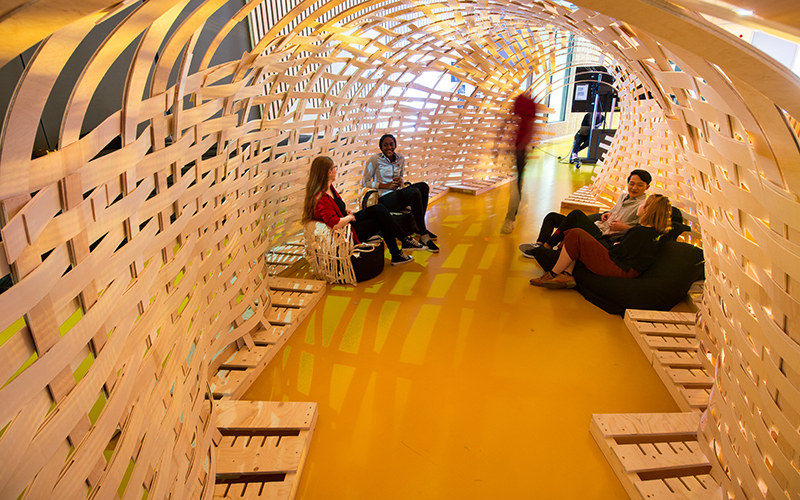 Made out of flexible wood, WeaValues invited visitors to explore and manipulate the structure from both outside and within, seeing how this changed the space and their response to it. Inspired by the importance of community and shelter, Momentum was a hinged aluminium structure of foldable squares with elastic membranes, which could expand and contract to any size. This pavilion was formed of a flexible, triangulated net structure, which integrated lighting and movement systems to create a comfortable and atmospheric space for visitors. This pavilion used flexible plywood arches filled with ornamental designs to create an enclosure that responds to the environmental conditions of light, shade and pattern. Tube Love used an array of tubular bells positioned on a tubular structure to form a hyperbolic curve. It was designed to be interacted with as both a musical instrument and a communal space. This pavilion was supported by Farnell. This interactive pavilion was composed of 3 modular elements with strings in tension. Visitors were encouraged to pluck the strings, producing vibratory sounds which were recorded and added to a digital loop, creating a collaborative soundscape. Tube Love and UCLoud, were sponsored by Farnell, a distributor of technology products, services, and solutions for electronic system design, maintenance and repair. Farnell provided the two teams with the main electrical components needed for their pavilions. The sponsorship allowed for the students to be ambitious and to execute the complexity of their designs. This event was part of the Bartlett 100 celebration.